Unless you own a boat or airplane, the only way to visit the islands is via one of several ferry services. Many of these services also provide ferry service between islands. During the summer months they run on a regular schedule. Most of the islands do not require a car to get around, and it's actually more fun to without having one on the island. There are plenty of other transportation options once on the island including bicycle rentals, golf cart rentals, and a few taxis. If you leave your vehicle on the mainland, make sure valuables are secured in the trunk and you park in the lot provided by the ferry service. Traveling up to 40 mph, Jet Express offers a 12 1/2 mile scenic tour. On your way, you'll pass seven Lake Erie Islands and many unique points of interest. 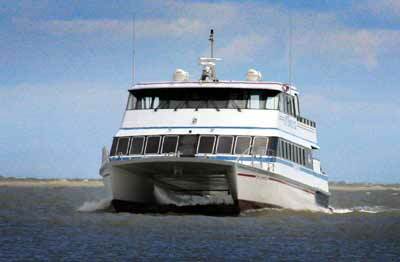 A knowledgeable crew is on hand to answer questions and provide service, shore-to-shore from downtown Port Clinton, and Sandusky to downtown Put-in-Bay, and Kelleys Island (Kelley's Island service departs only from the Sandusky Port). Kelleys Island Ferry offers the daily auto/passenger ferry service to Kelleys Island with a short enjoyable 20 minute boat ride. Boats are scheduled at least every hour (weather permitting) with additional service at peak times and holiday weekends. They have a family owned and operated fleet providing spacious travel areas either inside or out with the wind behind you. Miller Boat Line offers service to Put-in-Bay and Middle Bass Island. There are free parking areas near the loading area, but does not include the short term parking at the dock.